When we go to the Japanese store, Mitsuwa, in New Jersey, Jamie and I always share a Hamburg plate (Hamburger with sauce served with rice and soup) in the food court. 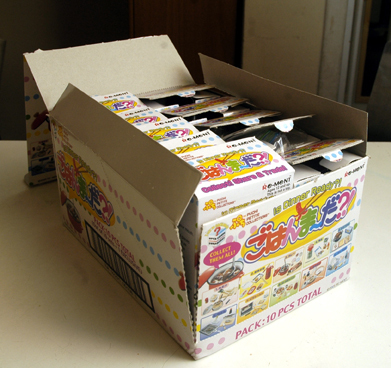 The flavors always bring me back to my brief time in Japan many years ago. 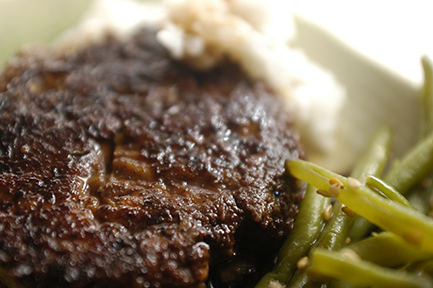 The other night, I decided to make similar Japanese style burgers based on this recipe, which I posted several years ago. Instead of ground turkey, though, I used beef, and made them bigger, more like the Mitsuwa ones we love. The sauce is thin, but is so delicious, and so much better than the sickeningly sweet kind you might find in the store. 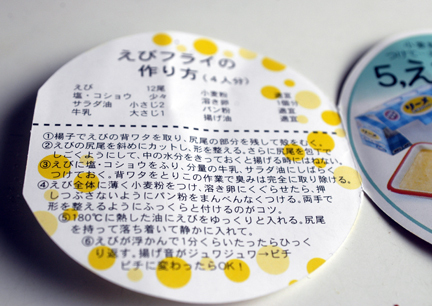 Mirin is a rice wine similar to sake, but with a higher sugar content. It can be found in Asian markets. You may have extra sauce which can be stored in the fridge and used in a pinch to season broiled salmon or other meat. 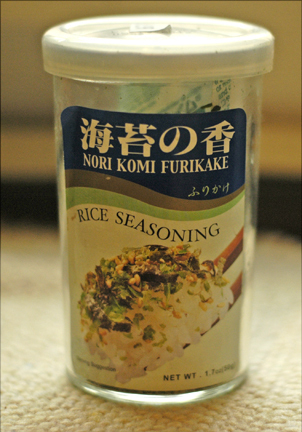 It is also good served over plain hot Japanese rice! 1. Soak bread with milk in a large bowl for about 10 minutes. 2. Add onions, garlic, salt, pepper, Worcestershire sauce to mixture. Then add ground beef. Stir it lightly with a fork. Then gently form into six large patties and place on plate. 3. Preheat oven to 450 degrees F. Heat oil in an oven safe skillet on the stove. 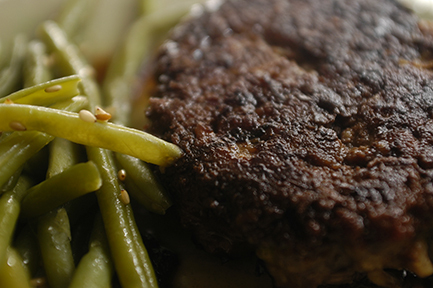 Cook burgers on each side until browned, about 1-2 minutes per side. Place skillet in oven, and continue cooking burgers for about five to ten minutes, depending how well done you like them. 4. To make Teriyaki Sauce, heat mirin and soy sauce in a small saucepan on low heat for about 1-2 minutes. Add sugar, stir to dissolve, and let simmer for about 1-2 minutes. Serve sauce over burgers and rice. I don’t know about you all, but I am so not ready for Christmas and the end of the year! 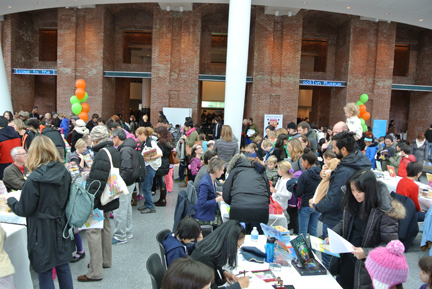 I find myself juggling so many things to begin with, but then there’s presents to procure, work to finish, cookies to bake… Before we left for our travels to the midwest for Thanksgiving, we three enjoyed the Annual Children’s Book Festival at the Brooklyn Museum. If you are in the area, it is a wonderful opportunity to meet Brooklyn authors. It’s usually the Saturday before Thanksgiving, and it’s free! It was packed like this all day. That’s me and Jamie on the bottom right. My friend, Claude, took this of us. 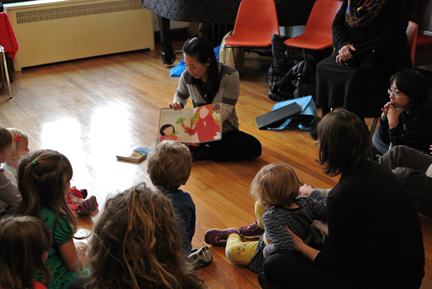 I also did a book reading, craft, and signing this past weekend at Grace Church School in Brooklyn, where Jamie went to pre-school. I can’t believe it’s been SEVEN years since we first entered that beautiful building! 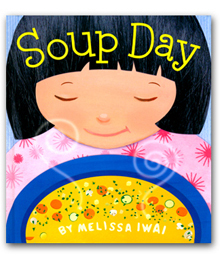 Me reading Soup Day — Jamie doing a great job not looking bored! As for the Omu Raisu… This is one of those common dishes that you could find everywhere in Japan — I haven’t been in ages, so I don’t know what it is like now. It’s a Japanese version of a Western dish. And as I saw when I lived there, way back in the 90s, “Western” often included ketchup. I taught a cooking class there with my friend, Elaine, to some of my (adult) English language students. Anyway, one of my favorite scenes in the movie, Tampopo, directed by Juzo Itami, is when this hobo makes Omu Raisu in a deserted ship kitchen for Tampopo’s son. View here. It’s so cute! 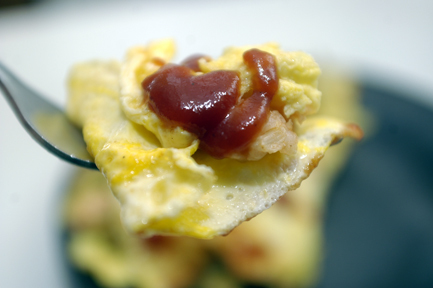 The hobo’s version is not stuffed– he cooks a perfect omelet and puts it atop a bed of ketchup rice. 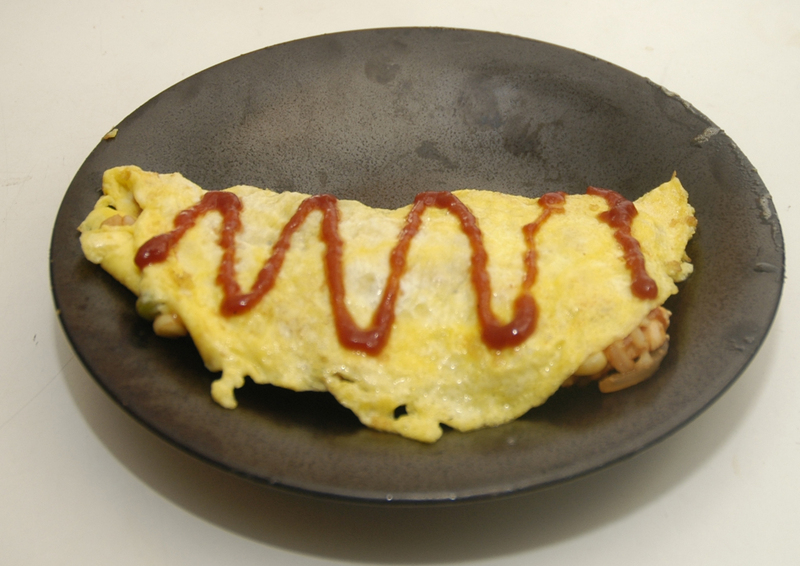 Here is a video on how to make a Miffy Lion Omu Raisu!! I found this while searching for the scene in Tampopo. OMG. The Japanese are so good at cute. 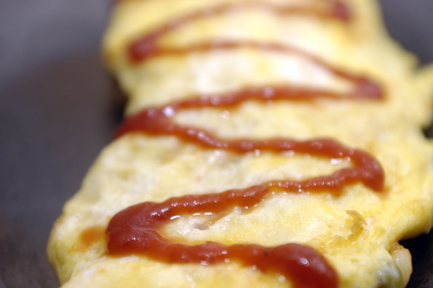 Omu Raisu is one of Jamie’s favorite dishes — he’s a ketchup fiend. I hadn’t made it in awhile, but while visiting my brother, he introduced us to this awesome YouTube channel, “Cooking with Dog”. We watched numerous episodes on Apple TV while there. I love that the dog just sits on a stool in the background as the chef cooks. Here is the Cooking with Dog Omu Raisu episode. My Omu Raisu is a simplified version. I don’t use tomato sauce, just ketchup. You can fill it with whatever meat and vegetables you like, but I like to use the traditional chicken. I love white rice, but only had brown rice on hand. As you can see, I have picky eaters to please, so I made different fillings for everyone. 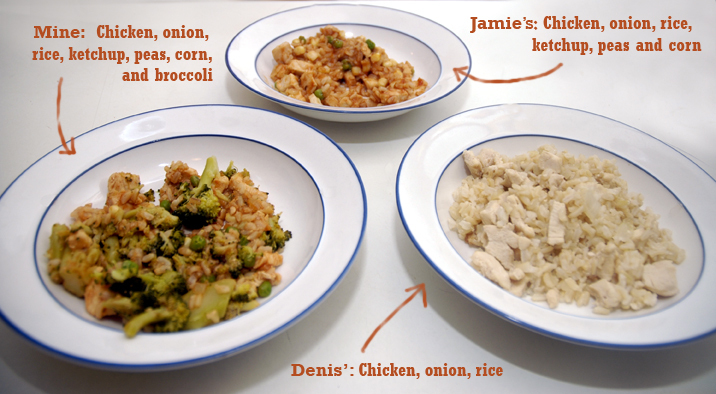 I made a big batch of chicken and onions and rice first; doled out a portion for Denis in a bowl; then added the ketchup, peas, and corn (all things Denis hates); doled out a portion for Jamie; and then added cooked broccoli to the remaining filling for myself. It was like a logic problem. Then I made omelets and filled with with each person’s filling! 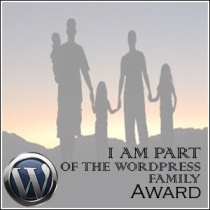 Before I share the recipe, I just wanted to thank Chef Mimi for giving me the I Am Part of the WordPress Family Award. Thank you, Chef! I usually don’t post about awards because I am extremely busy, and I always have a slight bout of anxiety thinking of gathering other links, notifying the recipients of the awards, and wondering what they will do. But I was so touched by Chef Mimi’s no pressure attitude. Plus, she’s a self taught cook like me and learned along the way while raising and feeding her family. 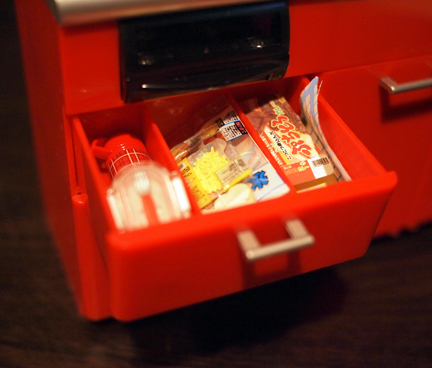 She has a wonderful collection of recipes in her recipe guide on her blog, so check it out! 1) Saute onions and chicken in 1 teaspoon oil in a non stick pan. When it’s cooked, added cooked rice and cooked vegetables and ketchup. Stir to incorporate. 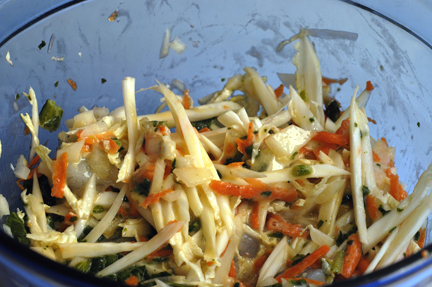 Remove to a dish. 2) Using a clean pan, heat 1 teaspoon oil and swirl around. 4) Serve immediately, garnished with more ketchup! Ebi Fry is basically breaded and fried shrimp –a diner-like comfort food I was introduced to while living in Japan. 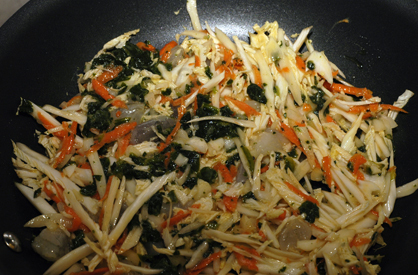 It’s commonly served with rice, some shredded raw cabbage, and miso soup as a “set” meal. I like to eat it with thick Worcestershire sauce or tartar sauce. Jamie helped me make Ebi Fry for dinner yesterday. He’s been wanting me to make it ever since he received the most amazing gift from his “Auntie Cheryl”, a close friend of ours who grew up with Denis. 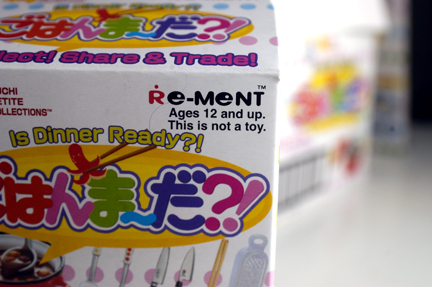 I present to you….. RE-MENT! 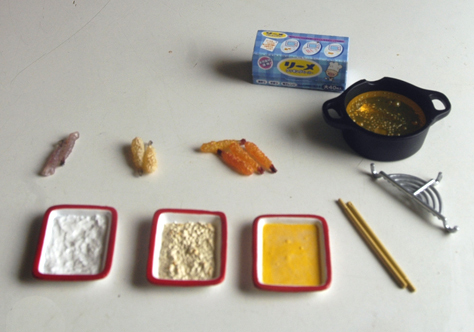 If you are not familiar with these amazing miniature Japanese foods you MUST– I implore you, you MUST check out the You Tube videos of RR Cherrypie! 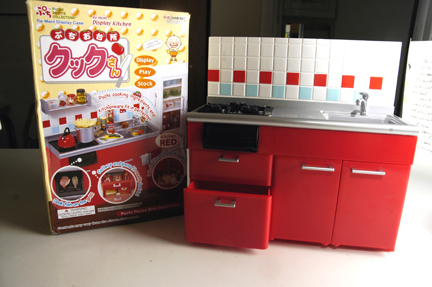 We first saw Re-ment models in these crazily hypnotic and soothing videos and then saw the real thing at Mitsuwa in NJ! 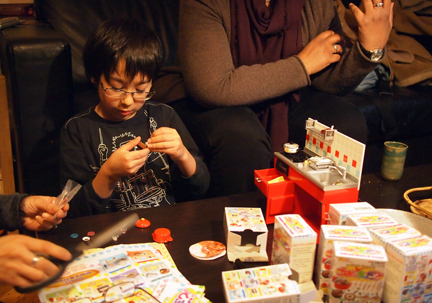 Jamie loved them and wanted a set, but they are a bit pricey and really — they aren’t a toy! It says it right on the box! Cheryl found them on ebay and presented Jamie with not ONE set but TEN! 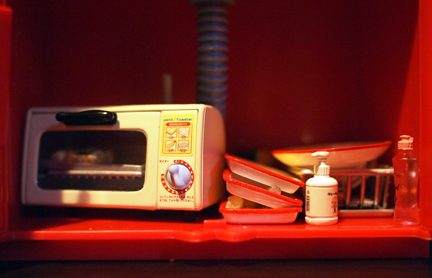 This toaster oven looks just like the one I used to have in Japan! 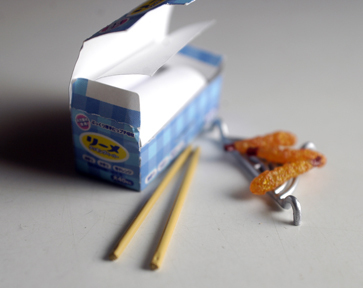 One of the sets is a miniature Ebi Fry. 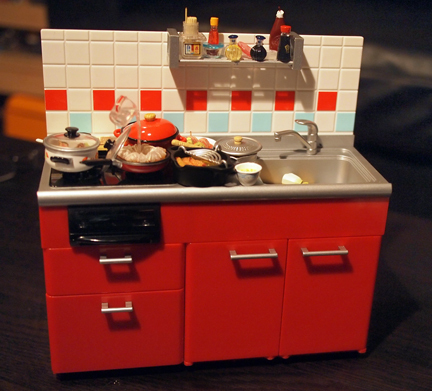 The amazing thing about these miniatures, as you can see from the videos, is that they show the foods at different stages of cooking and they are SO life-like! Comes with raw shrimp, breaded shrimp, and fried shrimp. 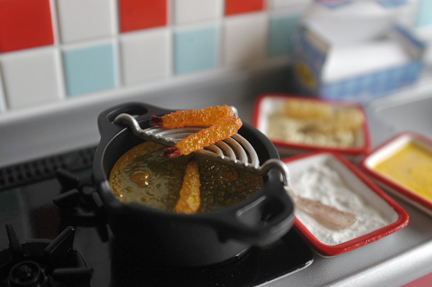 Frying oil has a little hole in it so you can fit shrimp in. It even comes with a little paper towel roll on which to “drain” your fried shrimp. Each set also comes with a recipe to make the dish. For our (real) Ebi Fry, we used a combination of large and jumbo shrimp. Lego Batman is impressed by the jumbo shrimp on the right! 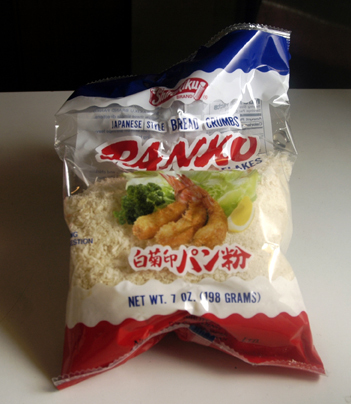 You can find Panko at Asian markets and sometimes in the International sections of grocery stores. I’m not sure which looks more tasty — the real version or the miniature version! All I can say is: Everyone should have an Auntie Cheryl in one’s life! Thanks, Cheryl!! Devein and clean shrimp, but leave tails on. Place shrimp on backs and make small diagonal slashes on the shrimp bellies (this will help it to stay straight when fried). Chop tips off of shrimp tails and squeeze out excess water with the side of the knife (this will prevent splattering when frying). Season with salt and pepper. Let sit in oil and milk for awhile to remove any odors (I skipped this step because my shrimp was really fresh and I didn’t think it was necessary). Pat dry. 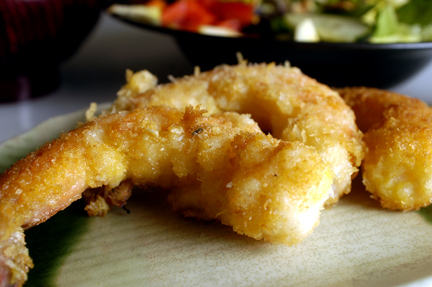 Dredge shrimp in flour, dust off, then dredge in egg, then coat in Panko. Fry shrimp for about 1 minute turning once or twice until golden. Direct translation: When oil makes a sound like “juwajuwa” and becomes like “pichi-pichi”, it is OK (done)! Today I thought I would share new developments in my artwork and my cooking! 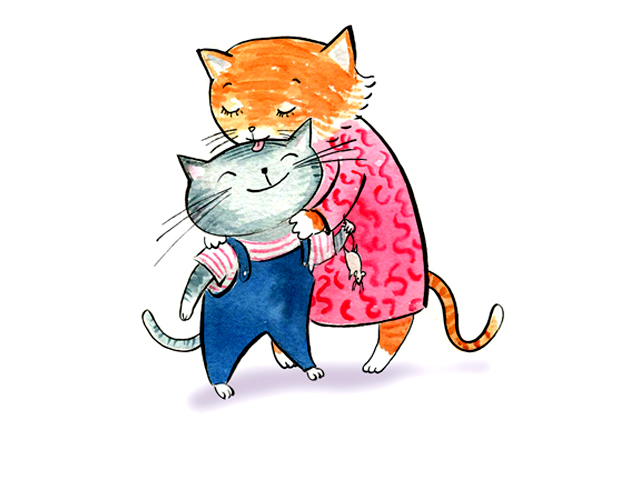 Until recently, the only artwork I was showing on my website was my paintings from books. I finally found the time to fill in the gap and added a new portfolio section which includes other pieces — both old and new. 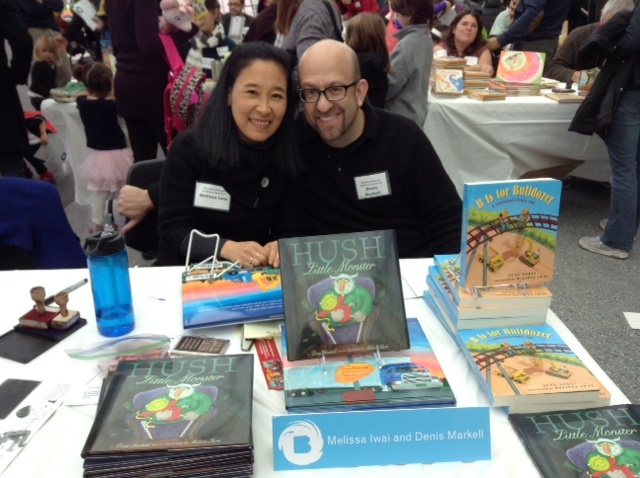 I just finished illustrating a picture book written by my husband, Denis Markell, that will be published next fall by Simon and Schuster. It was a really fun and challenging experience because I approached it differently and used line work painted with India ink along with my acrylic painting. Working with Denis was great. We bounce ideas off of each other constantly. 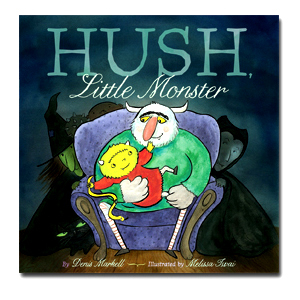 So it was a true collaboration with the author, unlike when I illustrate other authors’ books. I work independently with the editor and art director, and sometimes I never even meet the person who wrote it! I can’t show any samples from the book I did with Denis until it’s published, but it’s led me to do other pieces using the same technique which can be found here. Hopefully we’ll have more projects together in the future! 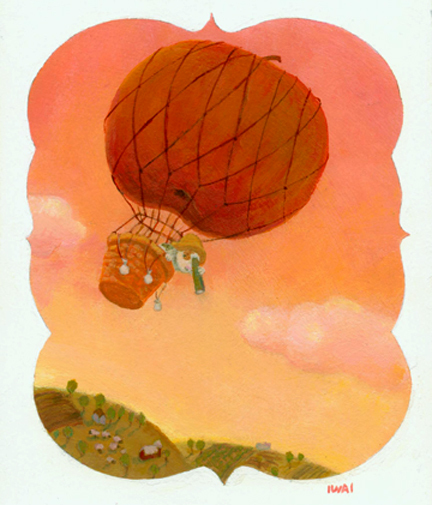 I have also been playing around with painting in thinner layers so my colors reproduce brighter. There was always a problem when I was painting in thick acrylic layers dark to light, layering colors on top of each other. I’ve always felt that the printed versions of the originals were always much darker and not as vibrant. They can easily look “muddy” and dark, especially if the printing is not well done. I have been recently painting with acrylics and dyes using watercolor and gouache techniques. I use little or no layering and I paint light to dark. I’ve been having fun using liquid frisket (which is why I had so much lying around to make my flesh wound!) and regular acetate frisket as well. I’d love to hear from you– Are you a painter? What medium do you use? Do you like to experiment with other art making techniques? Now, on to food and cooking — another art form! Actually this dish is pretty much a classic example of individual expression. 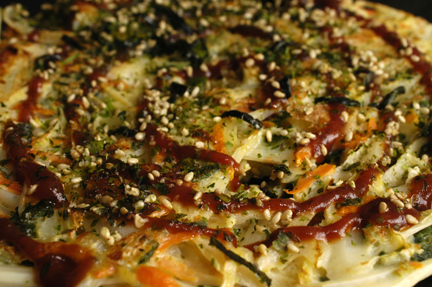 The name “Okonomiyaki” translates to “grilled/cooked to one’s liking”. Okonomiyaki is usually associated with Osaka but it can be found throughout Japan. 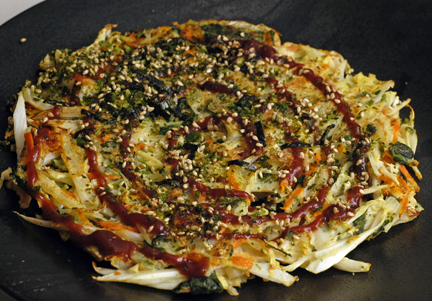 I’ve heard it called a Japanese Pizza, but it’s really more like a Latke, because it’s made up of shredded cabbage and other vegetables. You can also add meat or seafood to it. I’ve even seen a version with bacon. 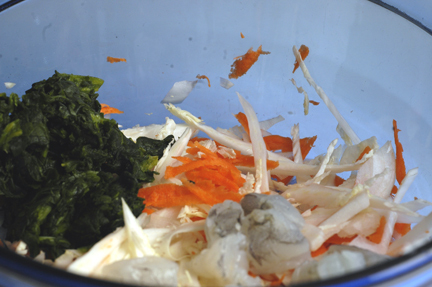 It is bound together with a mixture of egg, dashi (Japanese soup stock), and okonomi flour. I was never a big eater of Okonomiyaki when I lived briefly in Japan, but recently, I’ve become obsessed with it, and I’ve been experimenting and making it several times a week for lunch or dinner. It is such comfort food for me. The textures and flavors are great. This is my version that I came up with — I use soy sauce in place of the stock with a bit of water, and I use plain flour in a smaller amount instead of the okonomi flour. I also semi steam it to cook it, so I can get away with less oil. It’s a single serving and a perfect quick meal. I have bagged frozen shrimp and chopped spinach in my freezer. I thaw four shrimp in a bowl of cold water and nuke the spinach for 55 seconds while I chop the raw vegetables and prepare the batter and sauce. Then I shell and devein the shrimp and chop into pieces. Everything is stirred together with the batter and fried on the stove. 1. Mix veggies and shrimp in a bowl. Whisk egg, soy, water and flour in another bowl. 2. Coat veggies with egg mixture. 3. Heat 1/2 teaspoon oil in nonstick skillet. Pour everything in and flatten like a pancake. Cover and cook on low for about 2 minutes. Loosen with a spatula. Put a plate on top of skillet and flip over so pancake lands on plate. 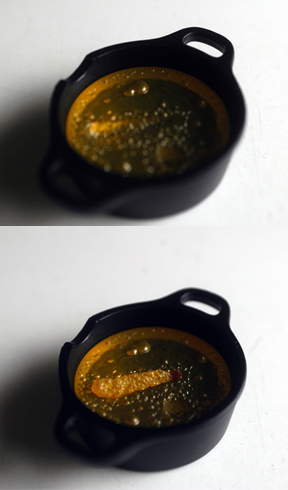 Add remaining 1/2 teaspoon oil in empty skillet. Slide pancake back in raw side down. Cover and cook another 2 minutes or so. Remove to plate. 4. Garnish with sauce (just mix the ketchup and Worcestershire together) and extra seasonings if desired. We recently celebrated belated birthdays of my sister-in-law and nephew in Long Island. 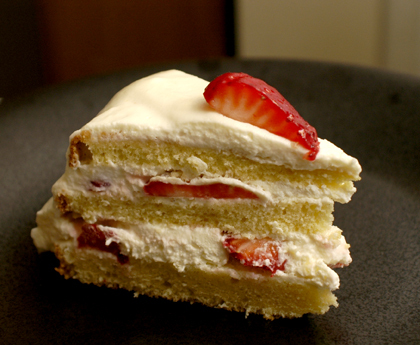 I brought the components of Japanese Strawberry Shortcake (sponge cake, whipped cream, and fresh strawberries) and assembled it at their house. This lovely cake reminds me of the ones I used to eat in Japan when I lived there as an exchange student. This was way back in the 80s when I was first introduced to European style bakeries. These little cute shops filled with beautiful French tarts, pastries, and cakes — many individually packaged and arranged like precious jewels in the display cases–were a far cry from the large American bakeries and doughnut shops I grew up with in my rural home town. A few years later, I returned to work in the hinterlands of Japan (Iwate Prefecture) after I graduated from college, and because I was around 22 at the time, I was the “perfect” marrying age. 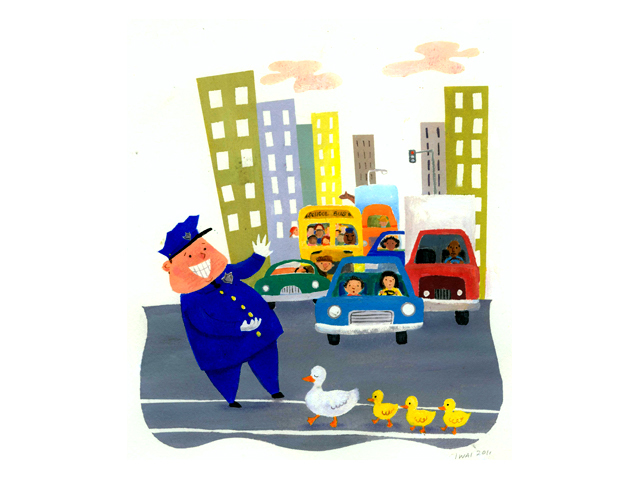 I used to teach English on the side to adults in the city. The well meaning moms would hint at this and attempt to set me up, though marriage was nonexistent on my “to do” list at the time. My students gave me this kimono as a going away present. 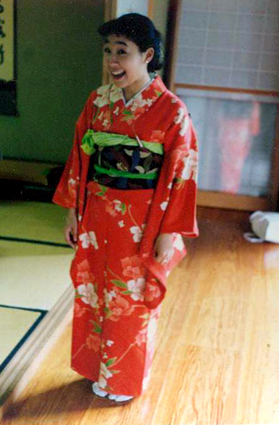 Married and older women wear more subdued colored kimono with shorter sleeves. They would chide: “You don’t want to become ‘Christmas Cake! '” — the English equivalent of “old maid”. In Japan, a mainly Buddhist country, people celebrate December 25 by having Christmas Cake as a secular tradition. 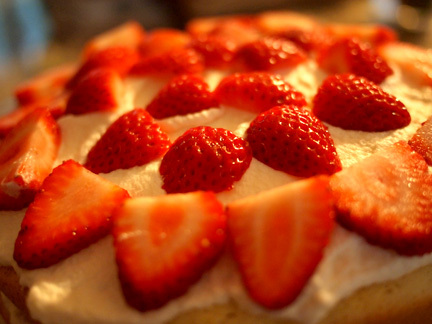 I loved having the strawberry shortcake — my favorite — with friends. 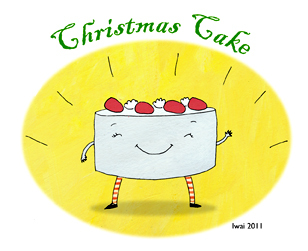 On December 26, the unsold Christmas cakes are discounted or thrown out. So a woman at age 26 is metaphorically ‘stale cake’, that is, past her prime for marriage. The thinking has probably changed by now (I hope!) as more and more Japanese women have been delaying marriage. Addendum: My friend, Elaine, whom I worked with back then in Japan and who still lives there, tells me that times have indeed changed: Now the phrase is “‘Oomisoka’ — ie, New Year’s Eve, ie age 31”. At 22, I was happy to become “Christmas Cake” any day — especially when it was as delicious as my beloved Strawberry Shortcake! This recipe comes from La Fuji Mama. The only change I made was to omit the gelatin for the whipped cream. For some reason it hardened before I could add it! It didn’t seem to matter though — the whipped cream held up well even though it had been transported in a cooler to Long Island, and the cake had been assembled hours before we ate it (and had been sitting in the refrigerator). I also added a dash of almond extract with the vanilla in the sponge cake. For some reason I didn’t have quite enough frosting to do the sides, so the next time I make this, I might make extra.